And it has come to pass that one such Samsung Galaxy SL Android smartphone has chanced upon our laps, thanks mostly to our friends at Mobile Monday Manila and their pre-December Christmas party. 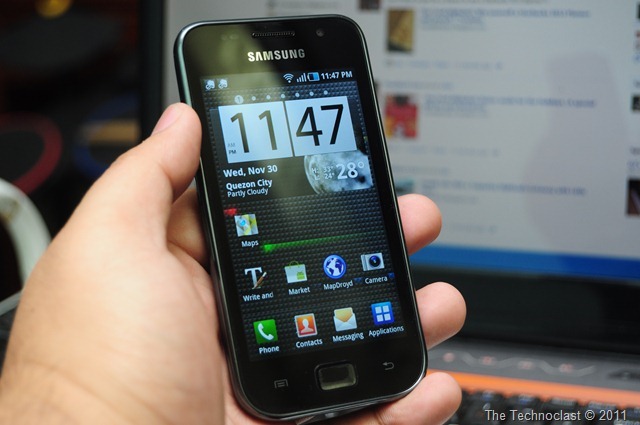 The 1Ghz Android that packs an SLCD variant screen of the popular Samsung Galaxy S still offers quite a decent package when it comes to an affordable, large screen smartphone today. The phone features a 4.0” 800×480 screen, 5MP camera with no flash, VGA front facing camera, 720p video recording, and most modern Android connectivity options rolled into a street price of a reasonable PHP 17,000. But before we get deep into reviewing the phone (which will come later), we’ll have to unbox it for you guys. So peep that video below! And that’s our video unboxing of the Samsung Galaxy SL smartphone! Check back later for our full review!